Bob Dylan briefly jumped from Columbia Records to the fledgling Asylum Records in the early 1970s. After he departed, Columbia took outtakes from Self Portrait and New Morning, and, without his knowledge, released them as Dylan. Most likely due to Dylan’s lack of input in the project, the album was never reissued in the United States. It is frequently maligned as the very worst Dylan album. Can it be? No, not really. But the reason that the Dylan fundamentalists dismiss this is precisely because they are tedious bores. There is a large contingent of Dylan fans who love his songwriting so much that they outright dismiss any of his albums that are not built upon it. 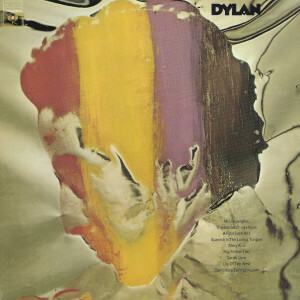 Dylan is a collection of cover tunes, without a single original Dylan composition. The thing is, this is much more focused than Self Portrait and has fewer head-scratchers than New Morning. Dylan may be purposefully stepping out of character here, but the results are respectable, even if by no means too impressive. Side one in particular is pretty decent all the way through. Side two slouches some more, with Joni Mitchell‘s “Big Yellow Taxi” too self-consciously tethered to an awkward new rhythm, and with much of the backing vocals seemingly under-rehearsed. But you have to admit that Dylan’s singing is generally stronger here than on New Morning. While this is no lost classic, it’s a better album than its reputation suggests. There is no doubt in my mind that Down in the Groove is a worse album, as are Self Portrait and Pat Garrett & Billy the Kid.